We did 5 trips in a row and then Deb and I took 2 days off since the last report. That post will come later. The fishing at the beginning was a little tough. 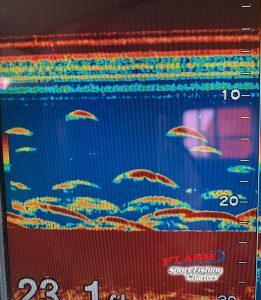 It was not hard to find the fish but they just had lock jaw. After our overnight getaway, the fish started to bite. The highlight was yesterday. 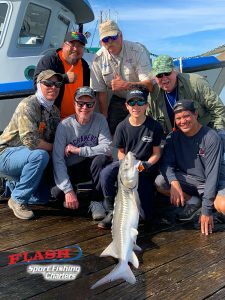 I had the crew that volunteered to work the kids program for me on the Martinez pier during the Diamond Classic Catch and Release Derby. What a great crew and what a great time! 13 year old David was aboard and taught the adults how it is done. You might recognize David as he is on the cover of the California Fish and Game Regulations. David hooked the first fish, which was a cute little sturgeon. Moments later Davis hooks another one. This time he had his hands full but he did great. 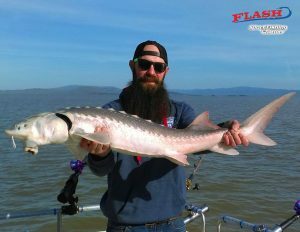 He landed a 52-inch fat sturgeon. 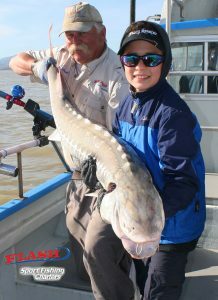 This was his first keeper sturgeon and his biggest fish to date, and David has landed a lot of fish. I had to cut the trip short as it was my birthday and I had to get to a family gathering. Before we headed to the harbor, David also released a small bass. It was a pleasure to watch David land his sturgeon. It made my day. I will be back on the water tomorrow as the tides are very good now. The next 6 days are full except for Friday, as that group had to reschedule. If you would like to join us on Friday, call me. Enjoy the photos!